The second site for the exhibition “Training for Modernity: Moholy-Nagy and the onslaught of the Digital” was the Bauhuas Archives in Berlin, Germany. This site posed new challenges since there were no walls on which to mount the projection screens. 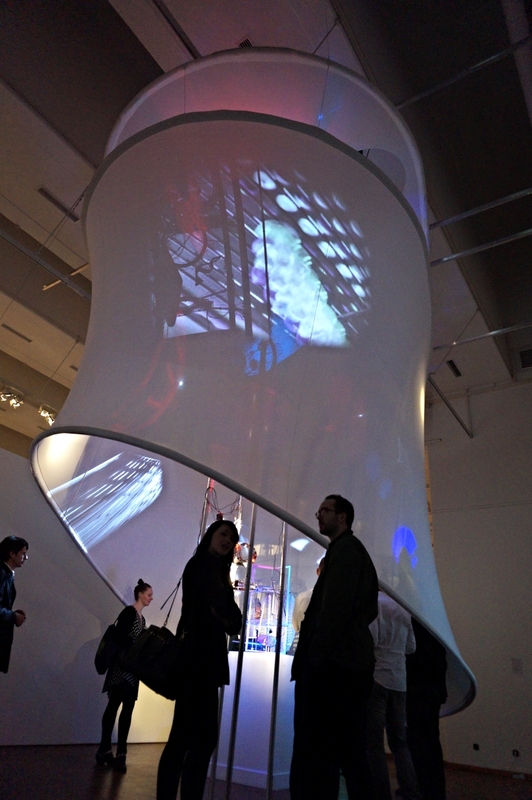 As a result this version of the Polycinema installation explored the suspension of a 23’ wide diameter elliptical screen that negotiated the territory between two hanging elliptical frames. These frames used the same 3/4" and 1/2" diameter fiberglass rebar used in Cocoon and On the Road/En Route. In this installation, the focus of the research became the control of this large form using self-forming fiberglass rings that gained their unusual shape through the configuration of different diameter segments along its length. Instead of a single diameter bar seeking to form a circle, two different diameter bars allowed for the varying stiffnesses to self-form a controlled elliptical shape that could be suspended from the beams above the gallery space. Digital modeling was used to anticipate the form so that a fabric pattern could follow the two ellipses that were offset by 20 degrees from the central axis. The Light Space Modulator designed by Moholy-Nagy and projection ‘tower’ that Harrop created were contained in the middle of the screenal space, casting their light and shadows onto the fabric.